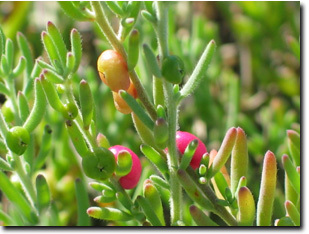 Native to mainly inland areas of all mainland States and Territories of Australia. A semi-succulent, perennial, much-branched shrub, up to nearly 1m tall. 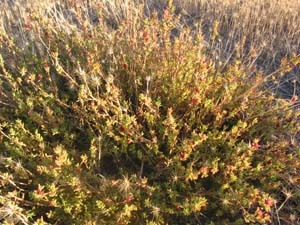 Leaves and stems are covered with hairs (woolly hairs on the stems),. 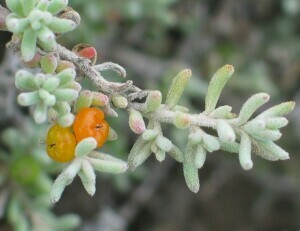 Leaves are short (6-15 mm), cylindrical, rounded and fleshy with a velvety surface. Flowers are small and solitary, held in the leaf axils (where leaf joins stem). Fruits are rounded, fleshy and tomato-shaped, ripening from green to red or yellow and drying to black. Flowering in spring to early summer. Grows in a wide range of soil types. Most often found in well drained sandy soils. 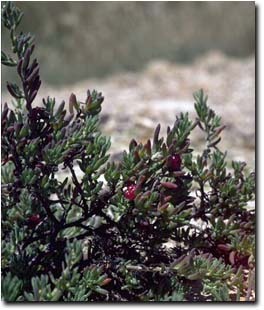 A hardy shrub, resistant to drought and frost. Not normally a dominant plant in saline communities but is quite conspicuous. 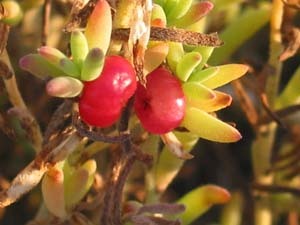 Often forms the shrub layer in woodlands. Not grazed much except during droughts.